Brand new out of the box, picked it up on my way into work today - haven't got to plug it in yet, but it's my first ESP, for guitar with EMGs (Het Set) - and the first thing outside of the EVH brand for guitars I've owned in two years.. pulled the trigger in a big way! Better review to come when I get it home and hooked up to my Mark V! But I'm excited. I remember being that excited about my Sno-White ESP SnakeByte also. It didn't last long. I ordered what I thought was the latest and greatest ESP SnakeByte from an authorized ESP dealer I found on the ESP website. I paid the $4400 price tag, and I received an older model ESP SnakeByte that was leftover stock. 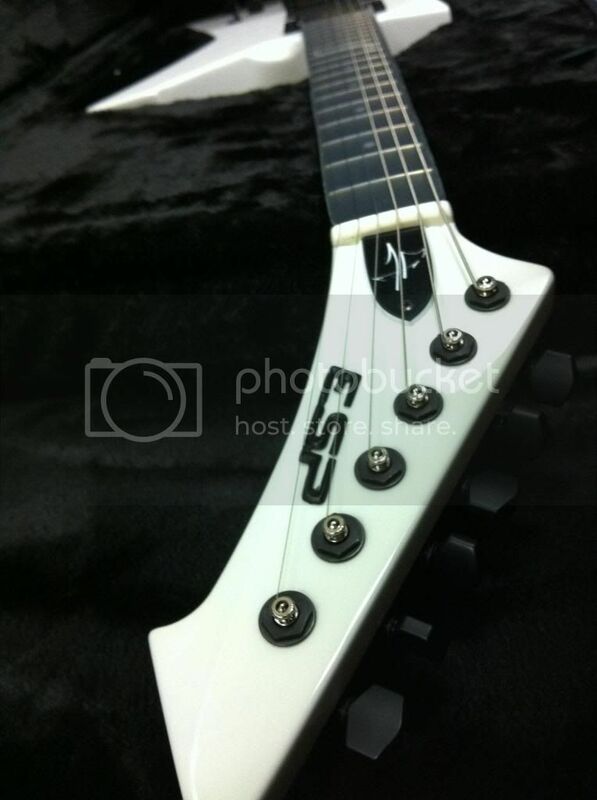 I didn't realize it at the time, it didn't occur to me that ESP or it's authorized dealer would f%&# me like that! They did! And they snubbed their noses at me when I complained about it! Say whatever you want about these guitars being the same no matter the year model, but when it's you getting screwed, it matters! I was never that impressed with the SnakeByte I received. I just never felt like I was playing a finely crafted instrument put together by an ESP Luthier. ESP claimed that all SnakeBytes were put together by an experienced ESP Luthier by hand. I didn't feel that at all It felt like $500 guitar put together by an overworked, underpaid, unskilled worker-bee! There are many who will not like what I'm saying here, but its the truth so help me God. I examined the guitar thoroughly from tip to bottom, looking for any sign of the $4400 I gave away, I never found it. Though there were some features I like about it, it was not to the standard I expected and paid for! I had that guitar for 3 years until I just couldn't take the $4000 mistake reminder anymore. I got to the point that it just pissed me off to look at it! So I sold it and took a significant loss. I have an LTD KH 602 from ESP that I like very much. It's a $899 guitar, and it plays and sounds very good. This LTD was always a much higher quality guitar that the SnakeByte I had. I have no plans to sell my LTD, I like it and it's a good break from my Gibson LPC every so often. Will I buy another ESP LTD? Sure, if someone is pointing a gun at me and making me do it, otherwise, f%&# no! ESP had the chance to make that situation right, they refused, and there isn't much I can do about it, except tell everyone I can online. mkcreel wrote: I remember being that excited about my Sno-White ESP SnakeByte also. It didn't last long. I ordered what I thought was the latest and greatest ESP SnakeByte from an authorized ESP dealer I found on the ESP website. I paid the $4400 price tag, and I received an older model ESP SnakeByte that was leftover stock. I didn't realize it at the time, it didn't occur to me that ESP or it's authorized dealer would f%&# me like that! They did! And they snubbed their noses at me when I complained about it! Say whatever you want about these guitars being the same no matter the year model, but when it's you getting screwed, it matters! I have a first run LTD Snakebyte I absolutely love. To the OP enjoy the new axe. The Snakebyte is an imposing beast to see and play!